An intermediate bulk container (IBC) or IBC tote or pallet tank, is a reusable industrial container designed for the transport and storage of bulk liquid and granulate substances (e.g. 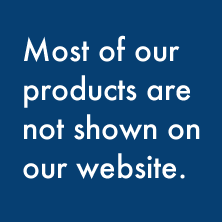 chemicals, food ingredients, solvents, pharmaceuticals, etc.). 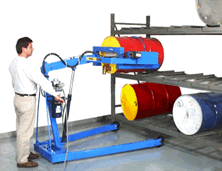 Intermediate bulk containers are stackable containers mounted on a pallet that are designed to be moved using a forklift or a pallet jack. 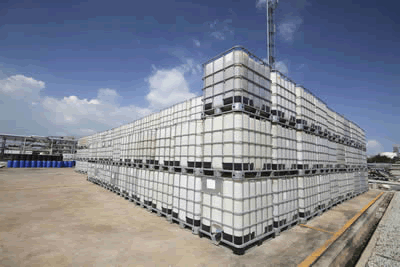 IBCs have a volume range that is situated between drums and tanks, hence the term “intermediate“. The most common sizes are 1,040 liters or 275 U.S. gallons or 229 imperial gallons and 1,250 liters or 330 U.S. gallons or 275 imperial gallons (the 1040 liter IBCs are often listed as being 1000 liters). Cube shaped IBCs give a particularly good utilization of storage capacity compared to palletized drums – one 275 gallon IBC is equivalent to five 55-US-gallon (208 L; 46 imp gal) drums, and a 330 gallon IBC is equivalent to six 55 gallon drums. The most common IBC is the one-time use plastic composite IBC; a white/translucent plastic container (typically polyethylene) housed within a tubular galvanized iron cage that’s attached to a pallet. IBCs can be manufactured out of a number of materials depending upon the needs of the shipper and the legal requirements that must be met. In addition to the plastic composite IBC, intermediate bulk containers are also manufactured out of fiberboard, wood, heavy gauge plastic, aluminum, carbon steel, and galvanized iron. 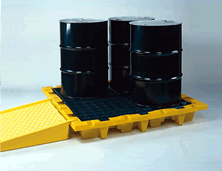 Heavy gauge plastic IBCs are made of reinforced plastic that requires no steel cage; they have a pallet molded into the bottom so the entire unit is manufactured as a single piece. 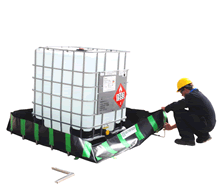 Folding IBCs are also made of heavy plastic, however, their sides fold inward when the unit is empty allowing the IBC to collapse into a much smaller package for return shipment or storage. 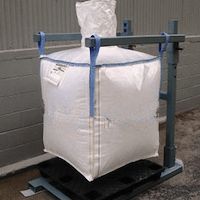 Flexible intermediate bulk containers, made of woven polyethylene or polypropylene bags, are designed for storing or transporting dry, flowable products, such as sand, fertilizer, and granules of plastic. Almost all rigid IBCs are designed so they can be stacked vertically one on top of the other using a forklift. Most have a built-in tap (valve, spigot, or faucet) at the base of the container to which hoses can be attached, or through which the contents can be poured out into smaller containers. 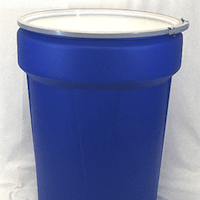 The Paper IBC container is a dependable, economical and environmentally responsible alternative to drums, bottle-in-cage and other “heavy footprint” types of intermediate bulk containers. 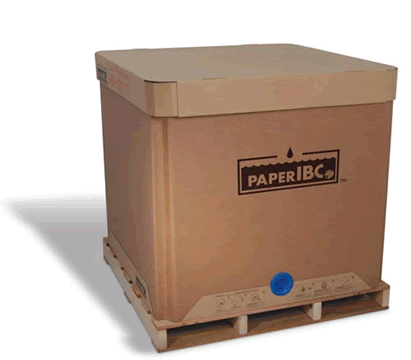 Dependable: The heart of the Paper IBC system is the Guardian form fit liner. Liners are manufactured in an ultra clean environment and are constructed of FDA approved materials in our IMS certified manufacturing facility. The Paper IBC container has passed the stringent ISTA (International Safe Transit Association) vibration and shock tests and has met the NMFTA (National Motor Freight Traffic Association) requirements for intermediate bulk containers for liquids. 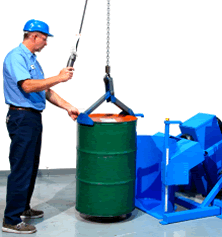 The heavy duty nine ply Paper IBC container is capable of withstanding up to 10,000 lbs of compression force. Economical: Unlike 55 gallon drums and other IBCs, there are no cleaning expenses or return freight costs associated with the Paper IBC and there is significantly less storage space required to inventory the containers and less freight expense to initially receive the containers. 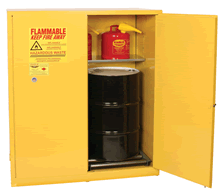 No cleaning or disposal costs and no return freight expense is incurred using Paper IBCs. 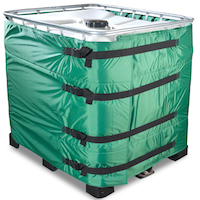 Collapsible Intermediate Bulk Container for Liquids, The reusable and collapsible 315 gallon IBCs for bulk liquids can be stacked up to 5 high when fully loaded and can endure long term outdoor storage. 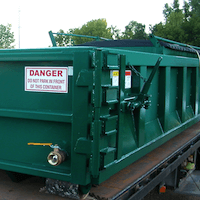 These heavy duty containers are also easily cleaned and can be collapsed to minimize storage and freight costs.